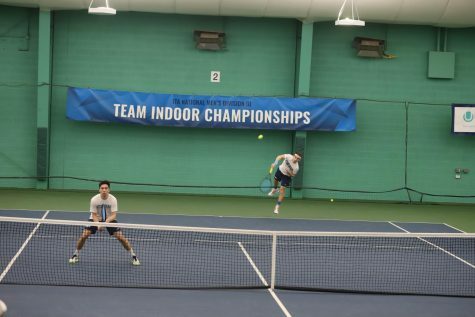 At the University of Northwestern Ohio in Lima, the Case Western Reserve University men’s tennis team’s performance was as “fly” as that racquet, posting a solid 7-5 singles record and a 6-6 doubles record against tough Division II and National Association of Intercollegiate Athletics (NAIA) competition. The Division II schools CWRU faced included Walsh University, the University of Findlay and Wayne State University, while Lawrence Technological University and host Northwestern Ohio were NAIA programs. The format of the tournament was changed to hidden dual, making the tournament more individually focused, because the number of games had to be reduced due to the rainy weather. First-year student Josh Hsia wasn’t too nervous about the Division II competition. “We had to come in with the mindset we could beat anyone there…I wouldn’t say better, good competition though,” he said. The tournament started on Friday with doubles play. Second-year students Henry Squire and Siddharth Rajupet teamed up to claim two wins, a 6-3 win over Wayne State’s Griffin Mertz and Derek Sammons and a 6-1 win over Walsh’s Tim Bruin and Filipp Kulynych. Squire then won a close match with second-year student Anthony Kanam, against Findlay’s Jorge Barnuevo and Trevor Majdalani. 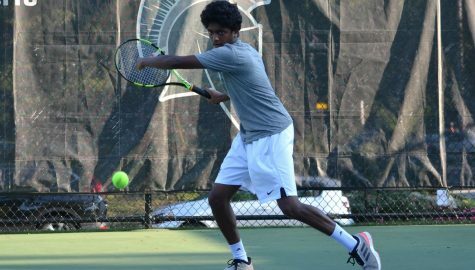 On Saturday, Rajupet and Kanam replicated their doubles performances in their singles matches, both going 2-0. Rajupet defeated Northwestern Ohio’s Marcos Salazar in a hard fought a 6-1, 5-7, 12-10, set and claimed a smooth 6-2, 6-4, victory over Wayne State’s Harvey Reed. Kanam topped Northwestern Ohio’s Artur Culicovschi 2-6, 7-6, 10-5 and Wayne State’s Niklas Kracz 6-7, 6-2, 10-8. Three other Spartans also picked up wins in singles. First-year student Earl Hsieh battled it out with Alfredo Barcelo of Northwestern Ohio, winning in a tough 6-4, 4-6, 10-7 set. Jhaveri pulled a clutch 5-7, 7-6 (7-5) win over Northwestern Ohio’s Thale Schmitz before Schmitz retired and Squire defeated Wayne State’s Daniel Kellenbenz 6-2, 7-5. 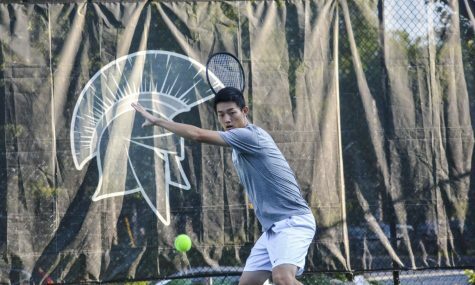 The invitational concludes the Spartans’ fall season. Their next match will be Feb. 9, 2018 at home against Oberlin College. “We’re going to focus on doubles, and hit the weight room…so we can serve stronger,” said Wojtkowski.